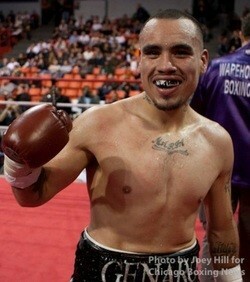 Following an exciting amature career capped by a win at the 2010 Chicago Golden Gloves, Genaro, turned Pro in 2011. Genaro’s focus is his training business, Pound for Pound BoxFit as well as his pro career. You can most always find Genaro in the gym working with clients, or, during a rare break, honing his own boxing skills.In addition to his considerable boxing experience, Genaro has 8+ years experience as a boxing trainer in the Chicagoland area.